If you’re reading this, you’re probably already aware of reports that Zhenya “John” Ogai, the man behind the Encore Club until it closed in July, has passed away. 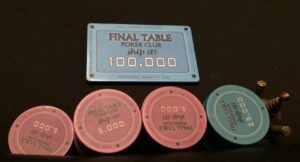 I briefly mentioned what Encore meant to me in the first weekly round-up I did after I got back from Las Vegas this summer, but as the most-trafficked club in the city—and one of the biggest poker operations in the Northwest—it meant a lot to most Portland players, even if they didn’t play there themselves. And John was the guy running the show. It can’t have been an easy task, running a business while treading the narrow ledge of city and state regulations that have governed the Portland poker scene for nearly six years. I’m not sure when I became aware of Encore. I started manually logging every poker session I played not long after Black Friday, and the first entry I have for Encore is in June of 2011. My third tournament there was (if I remember correctly) the first $10K guarantee they ran (I made the final table for 7th place), and my 20th was a couple of months after that, when I got second in a $3K Champions Freeroll (my first cash for more than $1K). I had my three biggest-ever cashes at Encore. But even though I have nearly 450 poker sessions logged there (almost all of them tournaments), I never got to know John well myself, though we talked nearly every time I ran into him. Paradoxically, the largest block of time I spent with John was just this spring, as Encore was undergoing its enforced transformation into PDX Poker Club. He was looking for some advice on transitioning the web site, and I was in need of some work. As it happened, between the timing of the changeover and my schedule to leave for Las Vegas, things didn’t work out for me doing anything significant, but we had a nice chat and I moved some computer files to the new web site for him. It’s exceedingly strange to think that I won’t run into him again. Sharks Circling the Sinking Poker Ship? Nah. Just a couple of Huck Seed sightings. 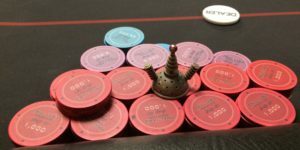 The WSOP Main Event winner was reportedly in town for a wedding and dropped by Final Table on Friday, then swung by Rialto for some hot 50¢/$1 NLHE action on Monday night. Nobody ever takes a picture from his right side. 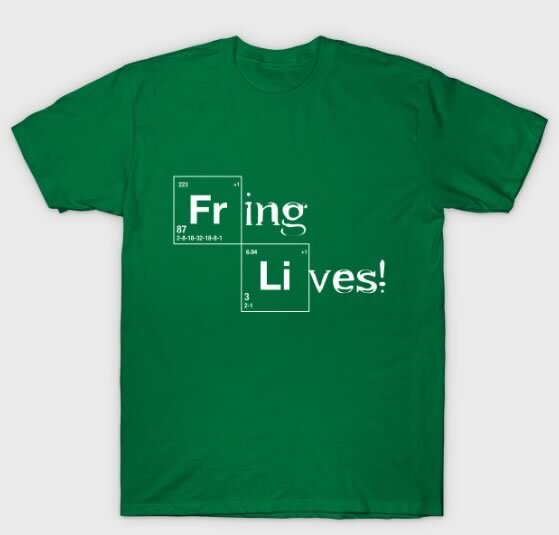 Some sort of Fring thing? ESPN’s 2016 World Series of Poker Main Event coverage starts Sunday, 11 September at 5:30 Pacific. But you can get in the mood next Tuesday (6 September) with two episodes of the Global Casino Championship at 7pm on ESPN2. Yes, gentle reader, I cast caution to the wind and put some money on Ignition Casino. I intended to play the Thousandaire Maker on Thursday night, but it was cancelled because there were only about eight players registered at start time. Played a Hyper Turbo Sit-and-Go, just three hands of a 6-Max where I saw the guy who took out my J♦J♠ get aces twice (online poker is rigged! ), halfway through the Sunday Thousandaire, then pulled off fifth place in a 62-player PLO tournament. Didn’t manage to repeat in the Final Table $10K (the guy who took me out the previous week won that one), but I was under 10bb and shoved AxQx, got called by AxTx and a ten hit the flop to take me out 72nd of 101. Friday night is the First Friday $20K at Final Table. The new format is $80 buyin/rebuy and $40 addon. Only one live rebuy this month. There hasn’t been an announcement of the times yet, but I understand that Rialto is hoping to run single-table satellites over the next couple of days for the Main Event and Big O tournaments at next week’s Chinook Winds Fall Poker Classic. New events on the calendar are the Rouge Valley Poker Classic, the South Sound Poker Championship, and the Todd Brunson Montana Poker Challenge. Tonight at 7pm is another satellite for the Muckleshoot Summer Classic series. The Bicycle Casino/WPT Legends of Poker wraps up with its final $240 event today, but you can buy in to Day 2 of the $100K guarantee for $1,400 (12% advance from Day 1) and get 125,000 in chips. No late reg, be there by 1:20. 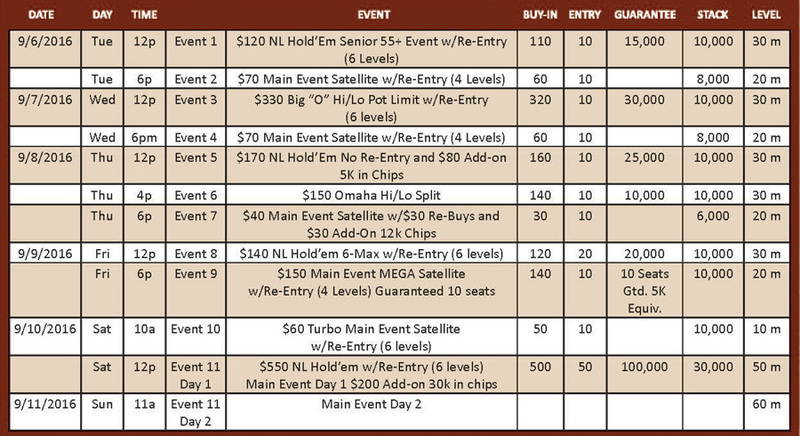 Sunday, Chinook Winds is hosting a 1-seat guaranteed satellite tournaments for their Fall Coast Poker Classic Main Event ($550 buyin, $200 addon). The Classic itself starts Tuesday with a 55+ Seniors tournament. HPT Indiana at Ameristar Casino Hotel, East Chicago wraps up this weekend with three flights to the $1,650 Main Event, with the first flight tomorrow. WSOP Circuit Las Vegas, at Planet Hollywood is ending on Labor Day. The $750,000 guarantee Main Event has flights on Friday and Saturday, with a $1,675 buyin. Friday and Saturday at the Pure Poker Summer Showdown at Casino Yellowhead in Edmonton, the Main Event (C$1,100 buyin) gets going. Day 2 is on Sunday. Tomorrow, the Venetian Deepstack Extravaganza 3.5 starts small with a $200 buyin $10K. Friday through Sunday at noon are starting flights for a $340 buyin $150K, with a $10K Omaha 8/B Friday afternoon and other events at 7pm every day. The Commerce Poker Series in Los Angeles is also under way tomorrow, with a $100 buyin $50K at 5pm. Friday has another tournament with the same structure at 1pm, and a $175 $25K 8-hour Time’s Up tournament at 5pm, where the money is chopped by “chip stack equity” at the end of Level 20. Monday is the start of the South Sound Poker Championship at Little Creek Casino west of Olympia. There’s a satellite (presumably to the Main Event) Monday, with a Seniors (50+) tournament Tuesday, Bounty on Wednesday, and a $340 Main Event on Saturday. A week from Friday is the Todd Brunson Montana Poker Challenge. In it’s tenth year, it’s held at Marina Cay Lodge on Flathead Lake, about 10 hours by car from Portland, through Spokane. The info on the tournament is sparse, but it appears to be a $333 buyin with four live rebuys during Day 1 (9 September). So if Chinook Winds is too…beachy…for you, you can hang out with Todd and the gang. The web page for the event has photos (no names) of Doyle and Pam Brunson, Hoyt Corkins, Michael Mizrachi, and Gavin Smith, though it doesn’t promise that any of those people will actually be there…. HPT Colorado opens up next Thursday, as well, at Golden Gates Casino in Black Hawk. The Muckleshoot Poker Summer Classic is just two weeks away. If you haven’t already watched the KGW-TV piece that aired last Wednesday evening, take a couple minutes and give it a spin. I’ll wait. I wouldn’t call it the worst piece of reporting ever done, but to flatly allege poker rooms that have been operating in the full light of day are “illegal” seems a bit odd, to say the least. And given that Portland Meadows has been running ads during the very same news broadcasts, it seems a bit hypocritical to be taking their money. The lawyer for the La Center rooms certainly looks trustworthy, doesn’t he? Finally, the B-roll footage they use for the poster shot (also appearing at 1:12 in the video): they do know that’s not a good hand in any games currently in vogue, don’t they? Nice five-card draw hand, but nobody plays that. My poker schedule has been curtailed a bit by a job, but I did manage to get over to Final Table for their Friday night $10K guarantee, with ended up with 120 entries and a prize pool of $14,040. I got there about 90 minutes after start time, determined to stick to a single buyin. Got KxKx my second hand but just won the blinds, and that was the only large pair I had the entire tournament. I was down a bit at the break (there were three shootout tables running), didn’t do the live rebuy or addon, and eventually got lucky with QxJx against AxKx to double up to about 20,000. From there, I didn’t turn back. Five hours in, we were just under 50 players left and I was below average but chugging along. We hit the money (20 players) a little before 3am, and we were at the final table a bit after 4. Finally got to play with the plaques Final Table got for their $100,000 guarantee. By the time we were down to 5, the chip leader was David, a reg from the club formerly known as Encore, Rich and Paul (both from Encore) were on his left, then me, and Jack, a reg from the 11am game at Final Table. Paul busted and I played the short stack for another 30 minutes before shoving two hands in a row from the small blind and the button. I had about 15 big blinds left and shoved Ax5x. Jack, in the small blind, had just doubled up through David and had AxQx, he called, and I went out in 4th place for almost 1,600% ROI after leaving a tip. Gave some of it back to the ecosystem on Monday, at the old home game (5th of 8 after a rebuy and playing every hand for the first three rounds, though I did pick up the high hand bonus) and a quick post-tournament stop at The Game, where I ran into Gypsy, one of my housemates in Las Vegas, and talked to her after she cashed out for longer than I lasted at the table. The Los Angeles area has been the innovator in the world of low buyin mega-multi-entry day tournaments with large prize pools, something that’s possible because of its large population and therefore large player base. The Mega Millions series at the Bicycle Casino is just one example. Now, four LA casinos have teamed up to offer the 2016 SoCal Poker Championships this fall, a five-day $3,000,000 guarantee tournament ($350 buyin for 12,500 chips) that has a grand total of 64 entry flights, with two flights over eight consecutive days at each of the four casinos. The flights are staggered from mid-September through early November, with the final stage of the tournament set for mid-December at the Bicycle. The Gardens Casino kicks things off, with entry flights from 18–25 September. The top 10% of each entry flight receives $600, the top 8% gets $700, and the top 6% gets $800 and advances to Day 2. A Day 2 follows the last entry day at each casino (26 September for the Gardens), Players can register directly for Day 2 for $4,500 to get 210,000 chips. Day 2 plays for 12 40-minute levels and is followed immediately by a Day 3 at each location (27 September at the Gardens), which plays down to 6% of the Day 2 field (0.36% of the starting field). Days 4 and 5 are at the Bicycle in December for all of the remaining players. If you make it to Day 4, you get a partial payout of $10,000. Like most of these multi-entry day tournaments, if you qualify for Day 2 multiple times, you receive money for your abandoned stack above and beyond what you would get for just making Day 2 ($800). To encourage early participation, you get more for the earlier flights: an extra $2,200 at Gardens, $1,700 at the Bicycle, and $1,200 at Hustler (no bonus for a second qualification at Commerce). And that’s not all. There is a $100,000 freeroll tournament for the 50 players who earn the most for participation in the series. Again, early participation is awarded, with twice as many points going to players in the Gardens flights (12) as those at Commerce (6). And you get 33 points for each Day 2 qualification. First place is guaranteed $500,000 and a Mercedes Benz C Class car. The Gardens and Bicycle qualifiers are scheduled during other tournament series at the casino, so they’re not the only reason to be there. If you’ve got other business in LA during the next few months, this is a series to look at. Once again, nothing special at press time. Tuesday, Final Table announced a 5pm Bounty tournament with a $500 guarantee, and it’s on their weekday schedule now, but I don’t know how well-attended it is. There is a one-day $100,000 guarantee NLHE and $30K PLO tomorrow at the Bicycle Casino/WPT Legends of Poker. The Mega Millions event beat its $1,000,000 guarantee. Saturday is the first entry flight for the WPT Main Event, a $4,000 buyin. The Atlantis Resort in Reno is host to the WPT Deepstacks tour through 29 August. 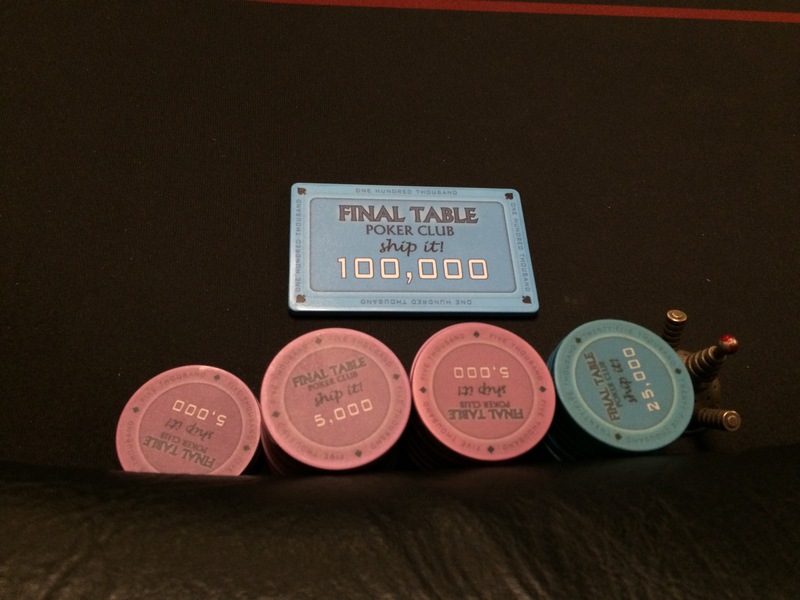 The series ends with a 3-day $250K $1,100 buyin Main Event this weekend. Sundays at noon through 4 September, Chinook Winds is hosting 1-seat guaranteed satellite tournaments for their Fall Coast Poker Classic Main Event ($550 buyyin, $200 addon) on 10 September. The satellites are $40 to enter (including fee and dealer appreciation), with $20 rebuys and a $20 addon. Also starting tomorrow is WSOP Circuit event at Planet Hollywood in Las Vegas, also kicking off a week from Thursday. The first event ($365 buyin) has six entry flights from Thursday through Saturday and a $150K guarantee. The Last Sunday of the Month, Tulalip Resort Casino is holding a $5K added tournament with a $230 buyin. Sunday is the start of the Pure Poker Summer Showdown at Casino Yellowhead in Edmonton. Five events ranging from C$220 to C$1,100 buyins (no guarantees. Thursday the 1st of September is also the opening of the Commerce Poker Series in Los Angeles. Despite the grumbling on Facebook about it, the Portland Tribune‘s Steve Law put together a relatively even-handed piece yesterday on the letter from the city that led to the closing of Encore Club last month. 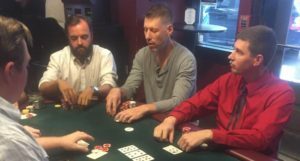 The article interviews several people on the Portland poker scene, including lawyer Mark Humphrey and Ricky Lee, general manager at Aces Full. It goes into a small amount of detail about the state Bureau of Labor and Insustries complaints that led to increased scrutiny of the the Portland poker clubs. It’s worth your time to take a look; whether you continue to play poker in Portland is dependent on the outcome of these events. My own take is, this was a train wreck waiting to happen, and it was dumb luck that things got as big as they did before the crash happened. Labor law came into being because of some pretty egregious past practices, and whether you agree with them or not, they exist, so when someone feels they’re aggrieved by their quasi-employer—whether they have a case or not—the camel of government will stick its nose in the tent to see what’s up. And if they find something that looks like an unregulated, unreported, untaxed exchange of cash, it’s going to perk that nose up. At the end, Encore’s weekly schedule had guarantees that were equal to nearly a third of the total in weekly guarantees at the Venetian in Las Vegas. It’s not something that can go unnoticed forever; all it can take is one disgruntled employee or customer to initiate the dismantling of the whole thing. Here’s to hoping that doesn’t happen. Just when I was starting to get better at poker…. Anyone who’s followed the blog for any length of time knows I’ve played on Bovada and taken advantage of its unique all-cards-exposed anonymous play to mine the depths of hand histories. As you may have heard, they’re shutting down poker operations and transferring the platform over to the heretofore-unheard-of Ignition Casino. Now, despite lots of heartache about their Mac client not working well until relatively recently, and complaints from other players, I can say that when I’ve cashed checks out from Bovada, they’ve gone through the deposit process with nary a hitch.I never had anything significant on the site (I don’t have anything significant) but I wasn’t about to move it over to Ignition. I min-cashed a small NLHE Turbo Bounty tournament the night before the announcement, with a little bit I had on there after the summer, then played my money out in a couple of tournaments. Maybe I’ll look at America’s Cardroom, they’ve got a series going this month…. I skipped my usual shot at the big time on Friday night and went for the funk: Big O at Portland Players Club (now in A&L Sports Bar across the intersection of NE 60th & Glisan from the old location). I hadn’t been in for exactly three months, what with seven weeks in Vegas and their reduced schedule, so I was eager to say hello. A $30 buyin doesn’t sound like much, but Big O with unlimited rebuys can be a volatile game. I got there late and spent some time catching up after the summer with Chadd Baker, then jumped into the game in the last level before break. I ended up on the table where one of the players was catching lots of cards, where almost everyone else had rebought at least once. I ended up rebuying in an early hand where I had to call with a good draw only to see it turn to much, then picked up a few chips before the break and added on. The average number of rebuys neared two per player ($100, with the door) plus the $20 addon. With only 15 players and three payouts, the mony up top wasn’t huge, but if you took 3rd place, you were making the same money as 9th in a $10K across town, and only having to go through 12 people instead of 100. Plus you get all those extra cards! I lost a big hand, folded a winner, then started chipping up before running kings and a flush draw into aces where I didn’t improve. Slowly checking places off my visitation list. The week after the Chinook Winds Fall Poker Classic (last week’s Deal), the Muckleshoot Casino starts up its end-of-summer event. I don’t know if it’s chance or just excessive whining, but the two events aren’t scheduled against each other this year, so if you can’t make one or, just maybe, you’d like to play the only two major tournament series within 200 miles of Portland (sorry, Wildhorse), you’re not forced to choose. 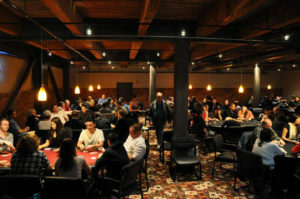 Muckleshoot may be the largest casino poker room in Oregon and Washington, with 32 tables, though many of them remain cash tables during tournaments. Their events aren’t large in numbers and there are no guarantees, but the size of the buyins and money added to the pot make for some decent-sized prize pools. Structure sheets are available (almost laughably, they’re photos of printed structure sheets). This month’s poker calendar from Muckleshoot shows the events and the buyins, mentioning $55K in added money, but neither the calendar or structure sheets mention how it’s distributed. According to Hendon Mob, last fall it was $4K, $4K, $5K, $10K, and $20K, but that doesn’t quite add up to the $55K. I’m guessing $5K for the first two events. Competition in the Seattle area is tough, as you might ecpect. Rep Porter won the Main last fall, and Portland’s Jake Dahl came in 4th. The smaller buyin NLHE events brought in about 280 entries, with the Main getting 230, and 160 for the Shootout. Porter took home $48K for his win. 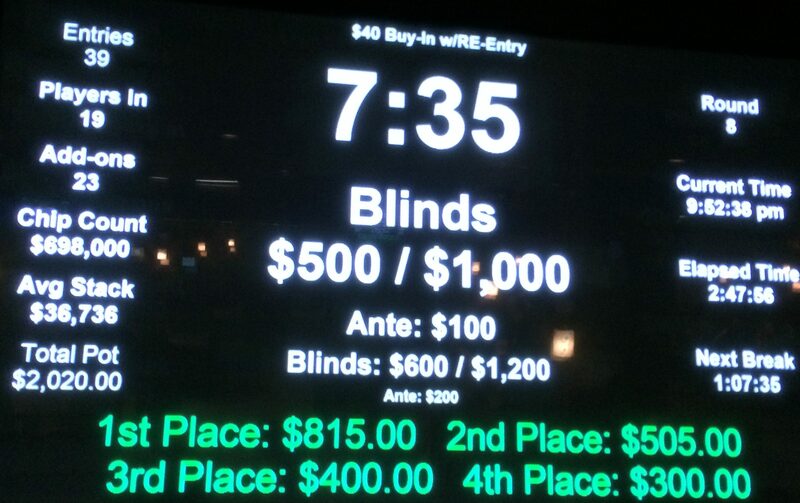 Entry into the $750 Sunday event and one of the weekday events. There are $225 mega satellites Sunday 11 September and at 7pm the following two days that award seats into all of the events. The good news is, even though I’m short on time this week, I’m able to keep up. The bad news is, there isn’t much to keep up on. So far as I’m aware, there isn’t anything off the regular schedules happening this week. Keep an eye out here and on the NW Poker group on Facebook. And, stealing from Chevy Chase on the first season of Saturday Night Live: Portland poker is still not dead. See the Deal above for for the Muckleshoot Summer Classic satellites. Today is Day F flights for Mega Millions XV at the Bicycle Casino/WPT Legends of Poker. There are flights through Monday, with Day 2 of the event on Tuesday. Mega Millions has a $1M guarantee, entry for most flights is $160 with a $100 addon. It is a best-stack forward tournament, with money paid for abandoned stacks. Tuesday has a satellite to the $550 HORSE tournament (with 10% of the field receiving a seat and $550 cash for their $150 buyin) and a $565 Survivor tournament that pays $5K to 10% of the field. Legends of Poker continues through the end of the month. The Summer Super Stack in Calgary continues through Monday, with a C$200K guarantee Main Event with flights Friday through Sunday. C$1.5K buyin. In Santa Ynez, California at the Chumash Summer Poker Series outside Santa Barbara, there’s a $100K guarantee with a $350 buyin on Saturday to wrap things up. Albany’s Black Diamond Hot August Classic starts tomorrow, with a $100 buyin freezeout. Friday is a Bounty tournament, and Saturday has two games with a morning $150 buyin Tag Team event and $150 Big O in the evening. Sunday’s event is a $250 buyin with one rebuy. The Atlantis Resort in Reno is host to the WPT Deepstacks tour for twelve days beginning tomorrow. It opens with a $5K guarantee Bounty tournament, then the first major event is a $400 buyin $50K guarantee on Friday. The series ends with a 3-day $250K $1,100 buyin Main Event next weekend. The Main Event had 330 entries and a $317K prize pool last year. A week from Thursday is HPT Indiana. That sounds like it’s a long way, but the venue is the Ameristar Casino Hotel, East Chicago, which is technically Indiana, but it’s just fifty miles from O’Hare airport (ORD), and since O’Hare is a major hum, you can often get round-trip flights from PDX for less than $200. Direct flight time is four hours. The opening weekend has a $100K guarantee Monster Stack ($300 buyin), The Main Event over Labor Day weekend has no guarantee ($1,650 buyin) but last September’s stop in Chicago had 432 entries with a $619K prize pool. Closer to home is the WSOP Circuit event at Planet Hollywood in Las Vegas, also kicking off a week from Thursday. The first event ($365 buyin) has six entry flights from Thursday through Saturday and a $150K guarantee. The series wraps up on labor Day weekend, with the $1,675 buyin Main Event ($750K guarantee), a $250 Seniors Event on the Sunday of Labor Day weekend, a $580 Circuit ring tournament on Sunday, and that evening, the $5,300 High Roller tournament. Last year, the PH fall Circuit event was in November, and the Main Event had a $1.5M guarantee that went to nearly $2M with 1,304 entries. The spring event this year at Bally’s beat the $1M guarantee by $800K; there’s no telling why the WSOP is hedging their bets this fall, unless they expect people to be occupied for Labor Day. 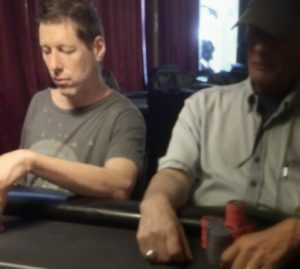 Last Friday night was the first big tournament to run since the sudden closure of Encore/PDX Poker Club in the middle of July, and despite my own personal disappointment at not doing better, the First Friday $20K guarantee at Final Table appears to have been eagerly anticipated by local players itching to cash big. Final Table $20K line to enter at starting time. I’ve played three dozen $20K events at Final Table over the past four years. Over the past year, at least two of them had overlays on the guarantees, for whatever reasons. Final Table discontinued their Fifth Friday events a while back, possibly due to an even more anaemic showing at those. So maybe they weren’t quite expecting what Encore’s closure—and possibly their change to the buyin structure—would do. 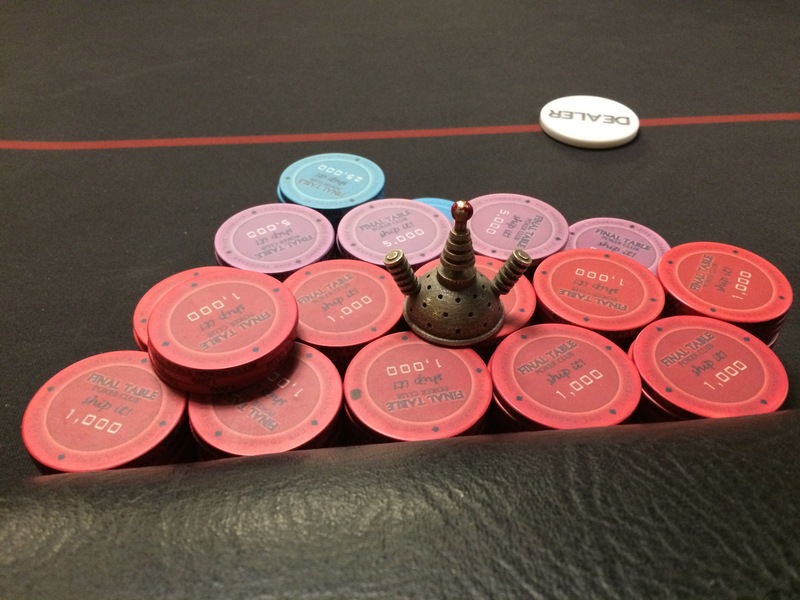 Previously, the $20Ks had buyins of $100, with a rebuy of $100 if felted, and a $50 addon. Now, I personally prefer that, but there has been a push in general toward live rebuys. 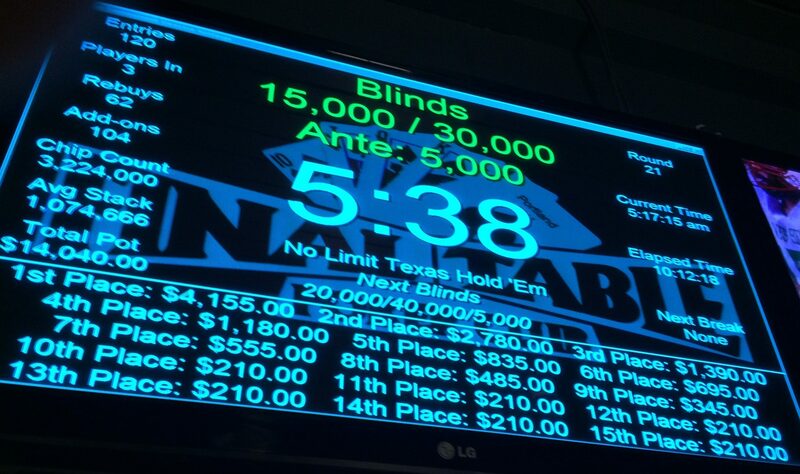 Friday night was the first Final Table $20K with a $60 buyin, 2 live rebuys, and a $40 addon. None of the other $20K events I attended had topped 190 players (other events like the $100Ks at Final Table have had far more). 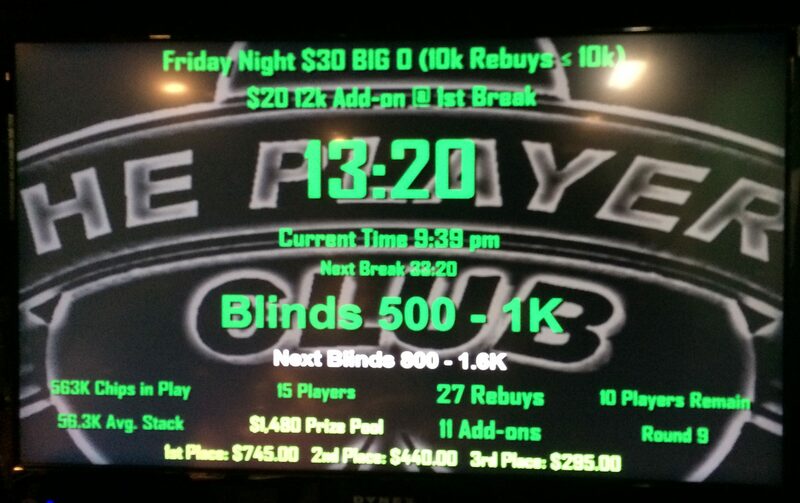 Friday night there were 235 entries, and a total prize pool almost double the guarantee: $36,160. Whatever my preferences might be, I think the days of felted rebuys in the $20K are over. The atmosphere was a bit chaotic. I don’t think anyone was quite expecting the turnout they got, and it seemed like there was a line of people waiting to buy in almost through the entire four levels of play before the break, and an alternate list that was seating people after break. The tables went 10-handed, which is not usually the case at Final Table (one of the advantages they had over Encore). On 20 events I have prize pool data for (sometimes I don’t make it that long), average expenditure for each player previously was $165, or a buyin, an addon, and 15% of another buyin. On Friday, even though the prize pool was nearly $3,000 more than any of the other $20Ks I had data for, the average expenditure was only $149 but represented the value of a buyin and addon and five-sixths of another buyin. I wasn’t able to make it to Portland Meadows for their Saturday $10K—a regular weekly feature at noon—but Brian Sarchi provided this image of the tournament board when I reached out to him for information. That’s $95/entry, by comparison. All in all, not a bad turnout at either location, with prize pools of 80% and 70% over the respective guarantees for what are now the largest regularly-scheduled events on the Portland tournament poker calendar. Much as I hate to play with live rebuys, Final Table’s move to the live rebuy system makes it more likely that they’re not going to be facing overlays in the big events, at least. I don’t think the same can be said for the morning tournaments, which have missed the guarantee all three times I played them in the past two weeks. Something’s going to have to change there, but for the big events, it looks like there’s still some healthy awards to be won. I played Tuesday night’s $1.5K guarantee, getting knocked out AxQx v. A♣Q♣ on a 4x4♣Qx flop when the board ran out runner-runner clubs, but they went well over the guarantee. There were a couple of tables of 1/2 NLHE and a Big O game running. Lasted exactly one hand in the Big O game, when I got it all in on a Tx6x4x flop with top two and an over pair (queens) against a straight with low draw and top set. 4x on the turn and 5x on the river improved everyone’s hand except mine. Full info on this fall’s series at Chinook Winds is out, with both the schedule and structure sheets now available online. It’s just under four weeks out, with the $110 buyin, $15K guarantee Senior (55+) event opening things up on Tuesday, 6 September, and the $330 buyin, $30K Big O game on Wednesday. There’s a $20K NLHE 6-Max on Friday, with the $550 buyin, $200 addon, $100K guarantee Main Event running on Saturday (Day 2 on Sunday). For anyone unfamiliar with Lincoln City, it’s about 90 miles southwest of Portland, on the Oregon coast more or less due west of Salem. There are a couple of routes to take from the metro area (about 2 hours if you stay under the speed limits), the more direct of which is down Highway 99W through Dundee and Dayton, but that can be torturous due to high traffic, particularly if you’re coming from the east side of Portland or from the north. My personal preference is to take Interstate 5 south all the way to Salem, then cut across on Highway 22 until it intersects Highway 18. It’s 15 miles longer, but can take less time. Coming south on US101, it’s about two-and-a-half hours from Astoria. If you don’t want to make the drive, there are some public transportation options, but the first thing to check would be the Chinook Winds shuttles that operate from Portland, Vancouver, and other cities in the metro area. Call the number on the schedule to make sure they’re running (you will need a Winners Circle cards from the casino). If you’re at the beach on a Sunday before it all starts, there are satellites to the Main Event at noon for $20. At press time, I’m not aware of any special events scheduled for this week, so let’s do a little inventory. Portland Players Club is located at A&L Sports Bar on NE 60th & Glison, just off I84. They run mixed game dealer’s choice Omaha shootouts Wednesday and Friday afternoons, with Big O tournaments Wednesday and Friday evenings and Sunday at noon. Claudia’s has shootouts in the afternoons every day, with evening tournaments seven days a week. Aces Full has a noon tournament every day except Sunday, with shootouts in the later afternoon. Rialto Poolroom has nightly shootouts, and hosts the Monday Mix. Portland Meadows runs tournaments at noon seven days a week, with shoootouts starting in the afternoon and a 7pm tournament. 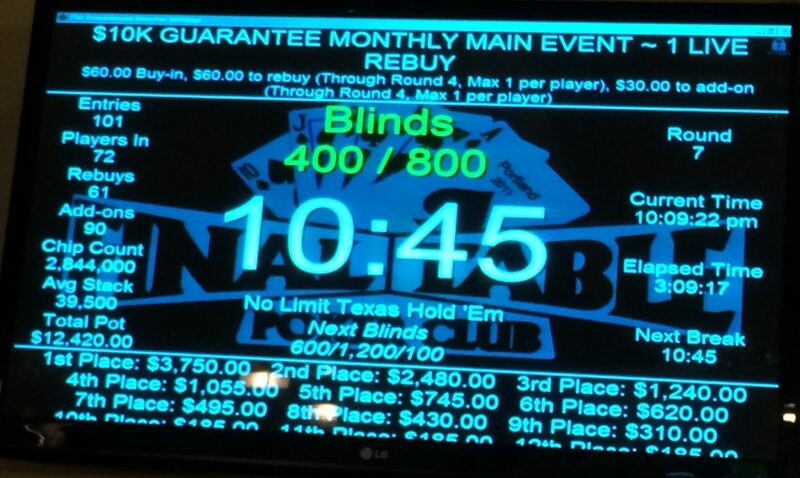 The noon Saturday tournament is a $10K guarantee, with a $5K on Sunday. The Game specializes in shootouts, starting at 11am, and has a Sunday afternoon $800 freeroll tournament. Final Table has a tournament at 11am weekdays, and another at 7pm, with a different schedule on weekends. Their regular schedule now includes a $10K on Friday night, with the $20K on the First Friday. They also have an active shootout section opening at 11am. This weekend at the WPT Legends of Poker at the Bicycle Casino in Los Angeles is the start of Mega Millions XV. There are starting flights from Friday, 12 August, with two or three flights each day through 22 August. Most flights are $160 with a $100 addon. 10% of the players make the money, and 5% advance to Day 2. On weekends, there is a third flight for $550 where 10% of players advance. Players advancing to Day 2 make $1,000, and you can enter as many flights as you like. If you get more than one stack through to Day 2, you choose which stack to play and get $2,500 cash and an entry into a $1.1K event for each abandoned stack. You can also buy in directly to Day 2 for $4.3K. There are two mega-satellites that feed directly into Day 2. Last year’s Legends of Poker Mega Millions had a prize pool of $1.7M, with more than a quarter-million up top. Round-trip flights to LA that span the last few days of Mega Millions are still only about $200. Today is the start of the Venetian August Weekend Extravaganza, which runs through the weekend with three starting days for a $250 buyin $80K guarantee. I wasn’t able to find flights to Las Vegas at the last minute for less than $300 though. The Deerfoot Inn in Calgary is the setting for the Summer Super Stack, which features a C$200K guarantee Main Event (C$1.5K buyin) with entry days 19–21 August. At current exchange rates, the buyin is $1,140. A round-trip direct flight from PDX to Calgary (YCC) for the last two days of the Main is $425, and the flight’s less than two hours. Friday, Saturday, and Sunday are entry days for the Arizona State Poker Championship at Talking Stick Resort outside Phoenix. Buyin is $1.1K, you can still find round-trip flight to Phoenix at the last minute for about $400. Last-minute addition at River Rock Casino in Vancouver, BC. Monday is the start of the Summer Poker Series at Chumash Casino Resort. 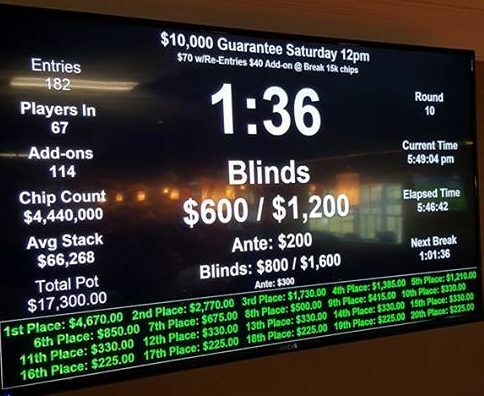 Their $100K guarantee ($325 buyin) is Saturday the 20th. Chumash is 125 northwest of Los Angeles. The Black Diamond Hot August Poker Classic starts a week from Thursday in Albany. See last week’s Deal. That same day is the start of the WPTDeepstacks Reno at Atlantis Casino Resort Spa. There are a total of 16 events, with a $250K guarantee Main Event from 26–29 August ($1.1K buyin). Roundtrip flights at the end of the series are running about $300. The Bay 101 Open runs 22–29 August in San Jose. Seven events, most in the $350–$550 buyin range, with the Main Event at $1.1K. The winner of the Main gets a seat into next spring’s WPT Bay 101 Shooting Star as well as the prize money. Special events include Omaha Hi-Lo and a NLHE Partners tournament. Most events are no re-entry, though you can enter each o fht eMain Event flights one time each. Tournaments start at 9am, making it tough to get a morning flight before play begins, but you can still get a flight Saturday morning at 6am that puts you in San Jose before 8am for $160 round-trip. If you’re looking for a late-summer trip and you’re nautically-inclined, CardPlayer Cruises is offering a 7-Night Pacific Coastal Cruise, leaving Seattle on 16 September (it’s a little bit out, but I presume you need to reserve your room earlier). The cruise stops in Astoria, San Francisco, and Victoria before returning to Seattle, and the schedule in the poker room (open only to passengers booked thtough CardPlayer Cruises) includes a $340 CardPlayer Poker Tour event and cash games. You have to call for pricing on the cruise, and CardPlayer Cruises doesn’t report their results to Hendon Mob, so there’s no way to tell how many participants there might be or how much action the cash games have, but if you want to take a gamble…. I didn’t get a chance to make it out much over the weekend, but I did play Final Table’s $8K guarantee on Friday night. 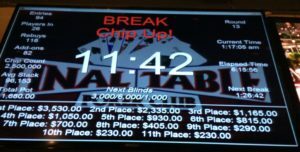 94 entries and live rebuys ($40 buyin/rebuy/addon) easily made the guarantee, for a prize pool of $11,680. Unfortunately, none of it was mine, as I had a great spot to 3-bet with QxQx in late position and got called by AxJx. Then he flopped AxJxJx and I was drawing very sliim. 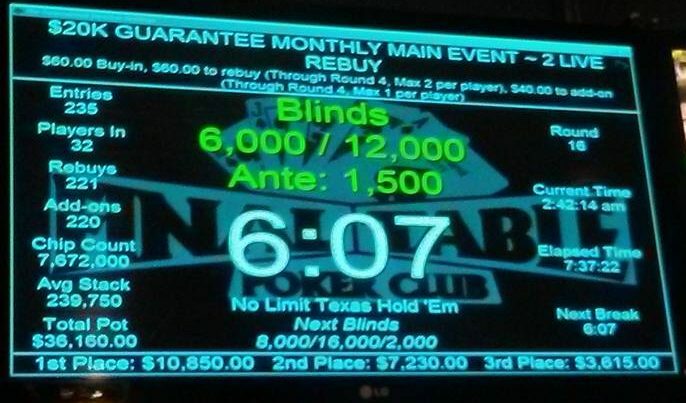 I did chop the 11am $1.5K guarantee on Monday, which had a small overlay with only 22 entries. The other big games in town over the weekend were at Portland Meadows. Tuesday I dropped in at Aces Full. They’re running a noon game every day except Sunday, with shootouts on Fridays and Saturdays in the afternoon, according to Ricky. Their website got back online while I was there, they’re running a $1K guarantee at noon on Friday and Saturday. The Tuesday game was just 10 players with a $480 prize pool. I squeaked into 3rd place. Too Old for the Main? This year’s Main Event final table bucks the trend of a bunch of wünderkind with an outlier or two. For the past several years, there haven’t been more than two final tablists over 32, this year, only two players are under 30, and 51-year-old Cliff Josephy leads the pack. This week, I revisited a PokerNews article I did last year. With charts! According to reports on the NW Poker Facebook group, Roger Tracey died in a car accident Monday. Roger dealt at several clubs over the past several years, and worked at Spirit Mountain and Chinook Winds casinos before that. Our thoughts are with his family and friends. I don’t generally get a chance to try out the samplings of poker down the valley, but I’m hoping to get the chance to play some of this series at the Black Diamond in Albany. The room is just off the freeway on the north side of town, about 70 miles from Portland. There’s a 6-Max tournament on the 18th, a Bounty tournament on the next night, Tag Team and Big O tournaments on Saturday the 20th, and a 60K starting stack $250 buyin on Sunday. That all sounds good to me. The 6-Max has a 42-person cap, which leads me to believe that there may only be 7 tables in the room, so seating may be limited. The announcement has a phone number you can call for particulars. There are no guarantees, but if the $250 buyin Sunday game got 4 tables, it would have a $9K in the pot. With 4 or five payouts for 36 players, that’s still some significant money. See my “Sweet Spot” article. Might be a good excuse to visit my family in town. This week’s big event is the First Friday $20K guarantee at Final Table. According to their web site, it’s a $60 buyin with 2 live rebuys and a $40 addon. It also says “More Details to Follow,” but I haven’t seen anything as of press time. An email that went out Tuesday afternoon indicates that they plan to run a $10K guarantee with the same buyin as the $20K on Friday nights. Follow @pokermutant on Twitter to get updates on late-breaking specials. At Thunder Valley’s Ante Up Poker Tour World Championship, the $250K Monolith drew 767 players for a $285K prize pool. Coming up this weekend is the Head to Head Championship, and the $500K guarantee Ante Up World Championship (entry Friday and Saturday, $1,650 buyin). WPT Legends of Poker at LA’s Bicycle Casino has entry flights to a $240 buyin $500K guarantee from Friday through Tuesday. The Summer SuperStack at Calgary’s Deerfoot Inn kicks off on 10 August. The first event is a C$550 buyin with three starting days. 10 August is also the start of the Venetian August Weekend Extravaganza. The big event is a three entry day $80K for $250. They are partnering with the Bicycle Casino to award seats to the Mega Millions event running during the Legends of Poker. The Arizona State Poker Championship runs 12–16 August at Talking Stick Resort outside Phoenix. Entry days Friday through Sunday, both limited to 470 entirs and 130 alternates, with the final day Tuesday the 16th. $1.1K buyin. The Chumash Summer Poker Series runs from 15–21 August, at the Chumash Casino Resort about 125 miles northwest of Los Angeles. Most of their events are too small to make the trip worthwhile, but they are featuring a $325 buyin $100K guarantee on 20 August. And if you get there a few days early there’s a $40 Big O tournament.